TDmonthly - Watch a Heartwarming Charity Giveaway! Watch a Heartwarming Charity Giveaway! Dan and Jill Driver of Jake's Toy Box in Arvada, Colorado have a unique story — that's why they were chosen as one of the winners of TDmonthly's first "2012: A Year of Charity" giveaway. READ ARTICLE Their little boy Jake passed away of a genetic disease at the age of 4, and a year later the toy store he loved was about to go out of business. The Drivers gave up their careers and bought the store, renaming it in Jake's honor. As winners of the contest, the Drivers received more than 100 specialty toys from generous donors Hape Toys, Safari Ltd., Schoenhut Piano Company and MagicForest Ltd. They were able to pass on these toys to their local charities, affording the "kiddos," as Dan calls them, an opportunity to have high-quality playthings to share and own. As Scott Shields, CEO of Family Tree, says, "These are toys that these kids would normally not have an opportunity to play with." Who knows what effect being given such amazing playthings may have on their lives down the road? New skills, new memories and maybe some new dreams, too. Manufacturers: To be part of TDmonthly's final Charity giveaway, check your email for our various promotions or email alison@toydirectory.com by November 28, 2012. Schoenhut ® Piano Company: "Leader in the World of Toy Pianos since 1872" Schoenhut’s® bright red, 18-key tabletop is the perfect choice for a toddlers first piano. Both fun and educational, it is an ideal instrument to use for developing eye-hand coordination and encouraging musical creativity. Schoenhut’s® patented Learning System, with its play-by-color teaching method, makes playing simple and fun. A removable color strip fits behind the keys to guide small fingers from chord to chord. The chart also works on adult keyboards, since keys on Schoenhut® toy pianos are of corresponding width. This teaches children proper "finger stretch" from the very beginning. The accompanying Songbook contains a collection of familiar tunes. This Learning System has been specially designed to build a child’s confidence and develop basic playing skills. This versatile 25-key piano measures 17" x 12" x 12" and is designed to grow with a child. The main unit, decorated with a whimsical animal's head, sits safely and squarely on the floor within easy reach of a toddler's hands. Later on, the sides with the animal's body can be attached, raising the piano to a comfortable height for an older child seated at the bench. The spacing between the keys is the same as that of a full-sized model, teaching proper finger placement and affording an easier transition to a large piano. This Schoenhut 30-inch Acoustic Guitar is a unique introduction to playing for the aspiring young musician. It offers not only great sound and playability, but an affordable price which is attractive to many first-time players seeking a "better-than-average" beginner guitar. Music is a wonderful opportunity for little ones to expand their sensory and imaginative personality. Music helps them to understand rhythm and harmony, and also to express themselves and their moods. This set of percussion instruments from Sevi is an easy way to get kids started. It comes with 8 pieces, including a tambourine, castanets, a triangle, maracas and a noise maker. 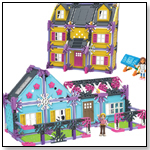 Produced by Sevi, Europe’s oldest wooden toy company, this product contains parts and components that are recommended for children ages 2 and up. Noah’s Ark Balance Game comes with pairs of brightly painted wooden animals and can be played either cooperatively or competitively by the entire family. 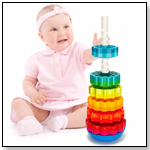 Kids learn about weight distribution and how the shape of an object affects where it is able to be balanced. Played against an opponent, kids learn to place animals just so their opponent has difficulty finding a spot for their piece. Pieces are the perfect size for ages 3+. Kids can also work together to see how quickly they can stack all the animals on the rocking ark. Sevi is Europe’s oldest wooden toy company. Everything tastes better when you've got the right accessories. These safe and simple toys revolve around food and cooking, to promote realistic role play, and encourage healthy eating. The Apron Set includes an elasticized chef's hat, quilted oven mitt and bright orange-trimmed apron. The mitt and apron fabric is exclusive to Hape. This sturdy little dump truck belongs at every construction site. The chunky maple design includes a removable load. The truck measures 4.6" x 2.4" x 3.5". Ages 10 months and up. String-Along Shapes are first toys that encourage coordination, dexterity, imagination, and simple problem solving. This brightly colored set of 30 maple shapes includes two strings that turn blocks into a train, a caterpillar or a tower. The possibilities are endless and so is the fun. Shapes are approximately 1.25' wide each. Join all the fun down on the ranch with our attractive accessories that complement the Safari Ltd.® Farm collection. Complete with fences, hay, entrance gate and a water trough, this set makes a perfect companion with our Down on the Farm Barn & Stable in addition to our Safari Ltd.® Farm animals. Children can let their imagination roam as they simulate life on a ranch. All our products are phthalate-free and thoroughly safety tested to safeguard your child's health. Safari Ltd.® takes pride in providing breathtaking, innovative and value priced replicas for now over three generations.